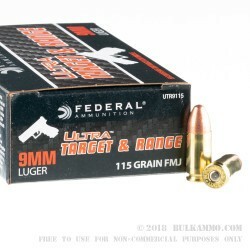 Why choose between low cost and high-quality when you can have both with this 9mm ammo by Federal Ultra? 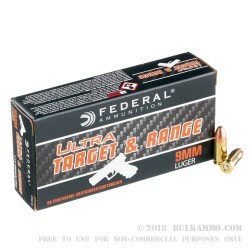 The 9mm Luger is one of the most popular pistol calibers on the market today, and Federal has released this affordable brass version designed specifically for high-volume range training. 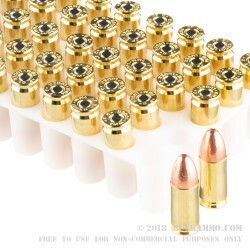 Quality components are required to make consistent ammunition, and Federal uses factory fresh brass casings, Boxer-primers, and clean-burning powders in this 9mm ammo. 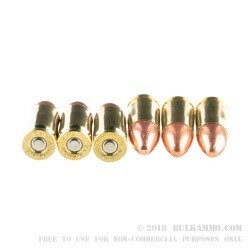 A light-weight 115 grain full metal jacket (FMJ) projectile is crimped snuggly into each reloadable brass casing and generates a muzzle velocity of 1125 fps. You can practice with confidence knowing shooters have trusted Federal ammunition since 1922. All of Federal's ammunition is rigorously inspected before leaving their Anoka, Minnesota factory. This ammunition comes in 1000 round cases containing 20 boxes of 50 rounds each.